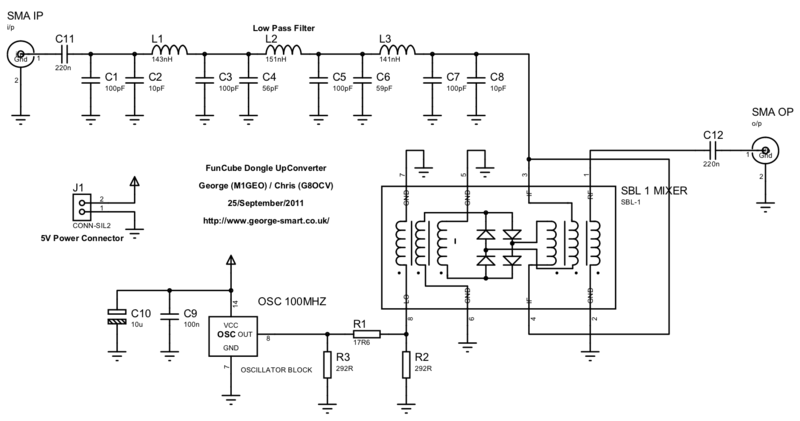 This page is about my HF Converter for the FunCube Dongle. The FunCube Dongle Pro edition (here, FCD) gives unlimited access to the frequency range 64 to 1,700 MHz for reception of all modes. As a Radio Amateur, I was also interested in HF reception (frequencies from 0Hz to 30 MHz) and the lower part of VHF. I therefore needed a way of translating these low frequencies, say 0 Hz to 64 MHz (where the FCD starts). This is a simple process and can be achieved with a frequency mixer. Using a double-balanced mixer, suppression of the input frequencies can also be achieved. Here this means that mixing the two frequencies, F1 and F2 results in the sum F1+F2 and difference F1-F2. The original inputs F1 and F2 should be suppressed (or largely attenuated). With the careful selection of frequency for F1 and filtering of input signals F2, you can see how a signal present on the antenna (at F2) at 1 MHz could be translated to a frequency of 1+F1 MHz. 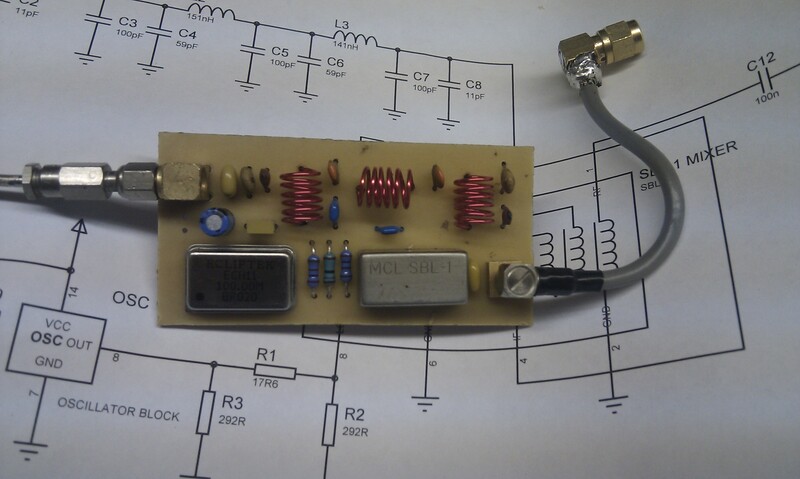 This project uses a oscillator block with an output frequency of 100 MHz for F1. This allows for simple frequency translation. A signal at 1 MHz would appear at 101 MHz, and so on; this is in the range the FCD can receive. There is also a need to filter the range of input signals present at F2. We need these to be less than the F1 frequency otherwise copies of the signals will appear inside the FCD’s passband – these are called images and add they add to the spectral congestion at the FCD. This project uses a low-pass filter at the input of F2 to remove any frequencies above 100 MHz. 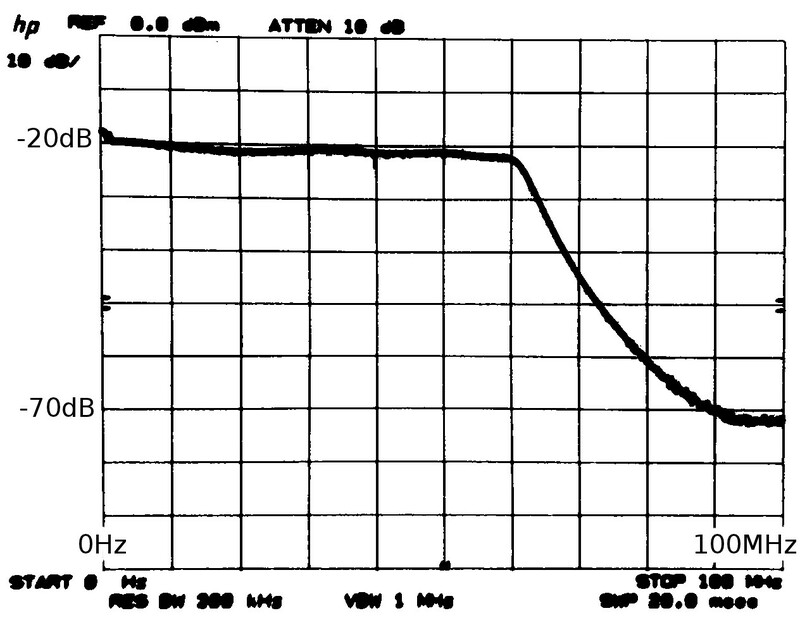 Specifically, the filter is a 7th-order Chebyshev low pass filter, 1 dB passband ripple, cut-off frequency of 62 MHz and stop-band frequency attenuation of at least 33 dB at 80 MHz. The filter has an impedance of . All design images are available as PDFs, scaled to make mask printing easier – see the PDF section. The image below is the schematic design for the system. It is fairly simple to construct. All 3 inductors in the low-pass filter are made from 6 turns of wire on a 6 mm former. The wire I used was 0.71mm (22 swg), but it makes little difference, just the physical strength. Using an inductance measuring device it is possible to fine tune the inductors, but they’re probably good enough as they are. The capacitors are grouped in pairs in parallel. This allows you to create the required values with standard capacitor values. There is a 3 dB attenuator pad between the oscillator block and SBL-1 mixer to help present the mixer with a port. The device is powered from 5 V supply, with the ground-plane at 0 V (J1 closest to the SMA socket). 5V input connects to J1 on the pin closest to oscillator block. Next we have the PCB Mask. The end result. My first prototype. These PDFs are provided if you wish to make this converter. The PDFs are scaled and will print at the exact size for parts placement. It has also been bought to my attention that PCBs available from Far Circuits for $5 USD. I have never seen the boards and have no connection with the company, but it may be of interest to people who aren’t able to make their own boards. By popular request, I have added the Gerber files for this design. These include the bottom copper, top silk screen, top solder resist, drill mask. I don’t use Gerber files, but using an online checker, they look reasonable. Use these in conjunction with the placement diagrams in the PDFs sections. The main component to test is the low-pass filter. I did this using a HP spectrum analyser & tracking generator outputting a signal of -20 dBm. A VNA would also do. I tested this partly out of curiosity, and I doubt it really is necessary to do as any tolerance problems in the filter construction will show at the high frequency end of the response. We can see that there is 50 dB of attenuation at 90 MHz. This then reached the noise floor of ESA, as the signal source wasn’t able to put out much power (-20 dB maximum RF output). The curved nature of the filter response after 60 MHz I’ve put down to coupling between the coils. These would need to be screened in order to minimise this coupling and give a more linear shape. Alan (G3NYK) raised an issue in the regarding how much of the local oscillator signal leaks through the SBL-1 mixer and appears at the FunCube Dongle’s front-end. I set about measuring this break-through. 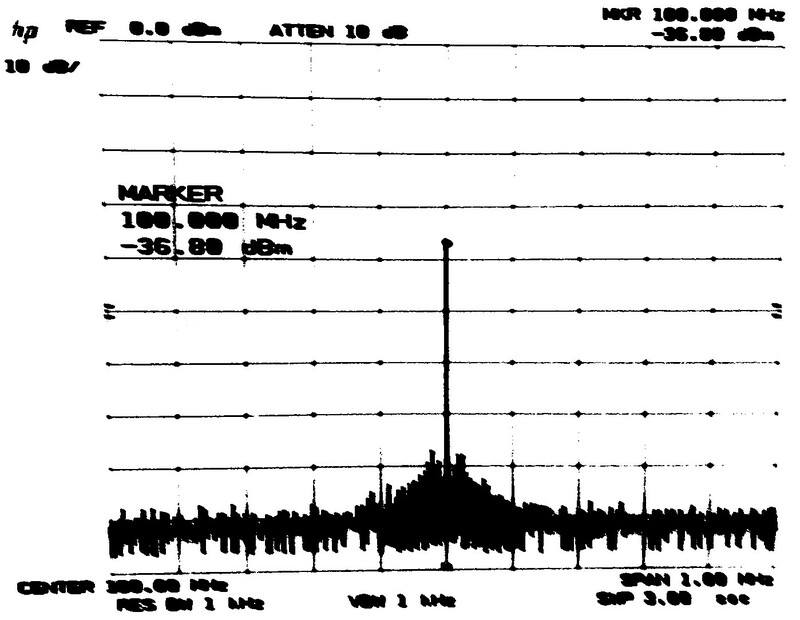 The poor phone-camera-spectrum analyser-print-screen below shows that the breakthrough at 100 MHz is -36.8 dBm. 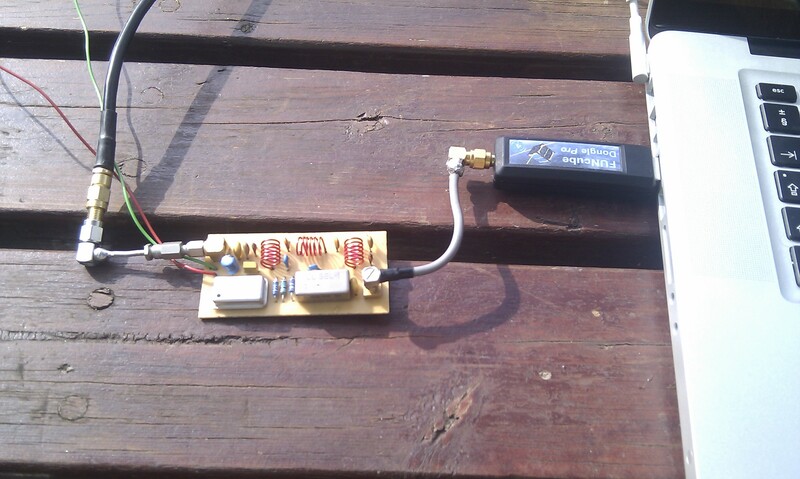 This is probably a bit high and could impair the sensitivity of the FunCube Dongle on HF. Lowering the mixer LO drive level by adjusting the attenuator pad, to exactly +7 dBm (as required by the SBL-1). : This just requires some simple calculations and offers some improvement for little effort (resistors R1, R2, and R3 recalculated/changed). Adding a pot to the mixer circuit would allow the mixer’s balance to be adjusted. : This should help the mixer to suppress the LO and RF inputs. Another option to help would be to follow the SBL-1 mixer with a high-pass filter to cut out the 100 MHz LO breakthrough. : This has the disadvantage of requiring a second filter, which would possibly impair reception on the low frequency bands (i.e. 160 metres). I will report back on these issues when I’ve had time to develop & explore further. The image below just shows some signals from the 40-metre amateur band that have been up-converted. 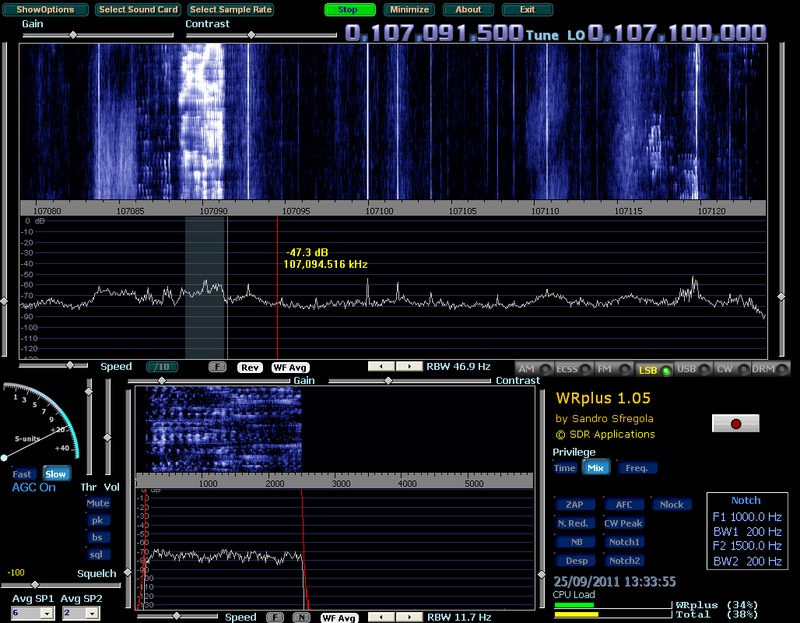 The software is WRplus SDR by Sandro Sfregola, version 1.05. To give you an idea of the sort of signals recieved, these audio recordings are taken from WRPlus shortly after the above print-screen was taken. During this time, background noise was high on 40 metres. These are just for an indication, and you should expect better results! : PE1JAS returns to GB0BAB’s CQ for the Steam Railway Weekend. Short copy. PE1JAS is weak, GB0BAB is strong and clear. : IK6BGJ calls CQ on 17 metres. Weak and with no reply. Conditions are bad and noisy. There are a number of known issues and future ideas, and the design presented above is a basic working device. 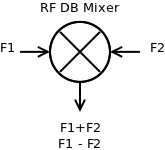 The design would benefit from a high-pass filter starting just below top-band (160 metres, 1.8 MHz) to keep broadcast bands out of the mixer input. : This does only seem to affect top-band, and to a lesser extent, 80 metres. A high-pass filter could be added after the SBL-1 mixer to reduce the appearance of the 100 MHz local oscillator at the input of the FunCube Dongle. : This could improve selectivity and will prevent the FunCube Dongle’s front-end from being over-driven. I will do some calculations regarding this. I would like to have diode switching around the up-converter to easily switch the circuit in and out for all frequency ranges, 0 Hz to 1.7 GHz. : This would allow me to box the FunCube and up-converter into a slightly larger box protecting the two devices and powering them both from USB.